Friedberg 202c (W-3920). 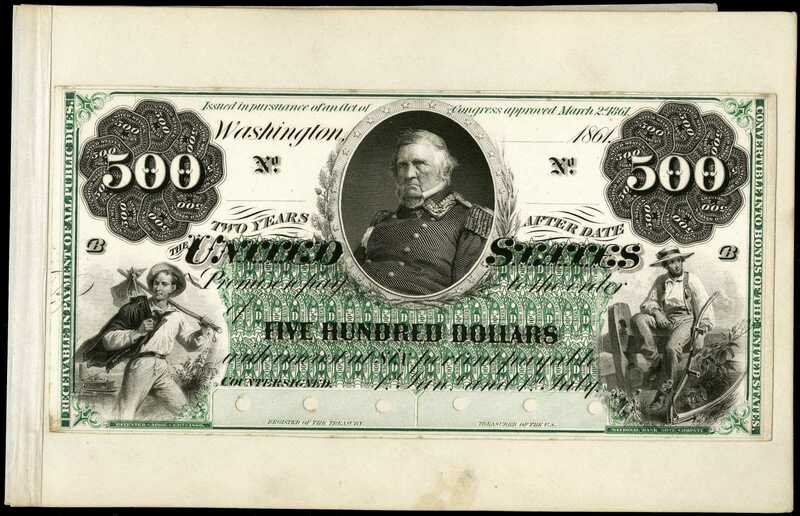 1861 Proof $500 Interest Bearing Note. PCGS Currency Choice New 63. Face Proof.Here is an impressive India paper proof mounted on card produced by the National Bank Note Company. Green border prints and security panel are featured along with ornate 500 die counters at top left and right. The "Grand Old Man of the Army," General Winfield Scott, is portrayed at center. Generic NBNC vignettes of a man traveling with a pack at lower left and a farmer resting with a scythe at lower right round out the face design which comes from plate position B. No issued examples of the type are known leaving only proof and specimen notes for collectors wishing to have a representative of the type. This proof impression is sharply printed in bold inks. Six punch cancellations are seen in the signature panels. pAt the time of issue the notes made for circulation were sold at a discount from face value to reflect the interest to be earned for two years. Most buyers were banks and security houses which retailed them to investors. They did not circulate in commerce, but were held until maturity, then redeemed at par. Proofs are a special case, of course, and serve to illustrate the designs of many notes that are not otherwise available.